After tossing a few emails and text messages, we were finally able to nail down a day to meet up and talk it all over. So I now have all the minis for the game sitting on my painting table. Which means, all other projects on on hiatus at the moment. But it's cool. I've wanted to pick up a copy of this game, but I'd never be able to keep up on the add-on characters, especially since I'm already deeply committed to my Super Dungeon Explore collection. This is the next best thing. I've never done a commission before. At least not one where I was actually getting paid for it. Most of the time I've done minis for my cousins or friends and they were for our own personal use in our RuneQuest or D&D games. But so far it's been really cool working with the owner of this game and showing him off my progress as it happens. Plus it's sweet showing off things to someone new. Star Wars: Imperial Assault is a miniatures based board game by Fantasy Flight and has one player controlling the forces of the Empire and another player or players playing as heroes of the Rebellion. I haven't actually seen it played, but based on the mission book and the way the titles are laid out, it screams Space Hulk to me. 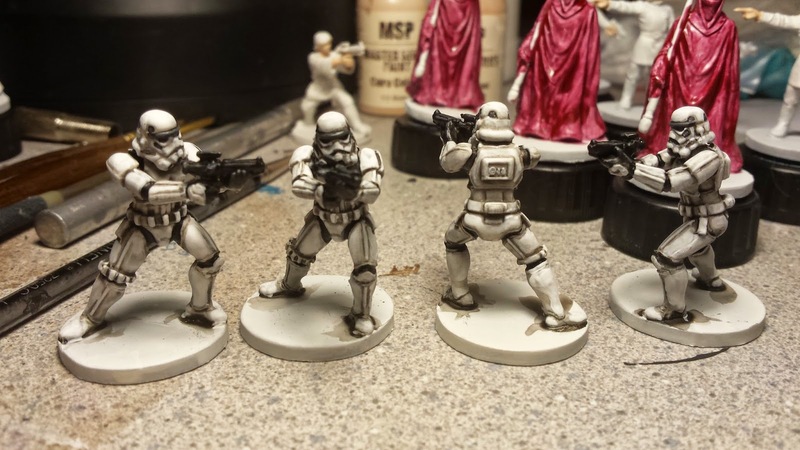 So far, I've gotten the Stormtroopers finished, with the Emperor's Royal Guard and Imperial Officers close behind. 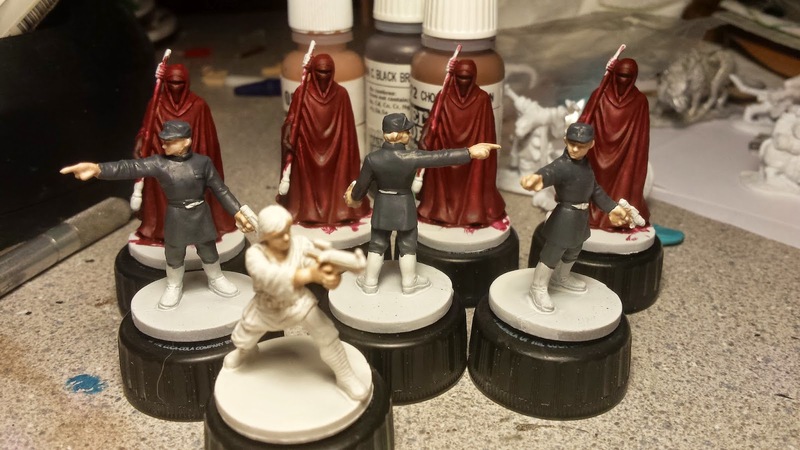 Since I needed to paint the skin on the Imperial Officers, I also painted the skin on Luke Skywalker while I was at it. But, I'm working through the squads first and then moving on to the characters last. Mostly because I find squad painting to be uninspiring and sometimes boring. Where characters are more fun and allow for more individual attention. 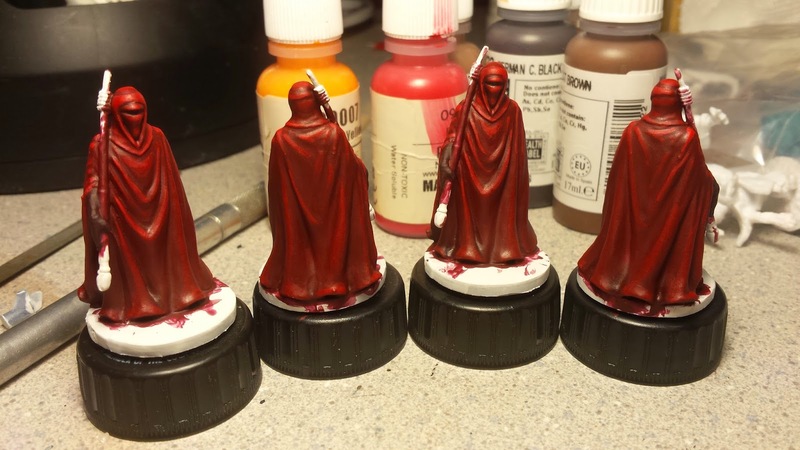 All of their bases will be done once the set is finished. I'll be adding some sand and I picked up some Games Workshop tufts to use instead of the standard static grass. The plan is to give it a bit of a desert look. It should end up looking real nice when I'm done.